The first step of publishing your app, once it is ready, is done in Visual Studio's Publish wizard. You invoke it by right clicking the project in the Solution Explorer end clicking on Publish... there. On first start you will need to create a named publishing profile, so that you can only invoke it on subsequent runs. Since I wanted to manually copy the files to IIS, I selected File System as the publish target. 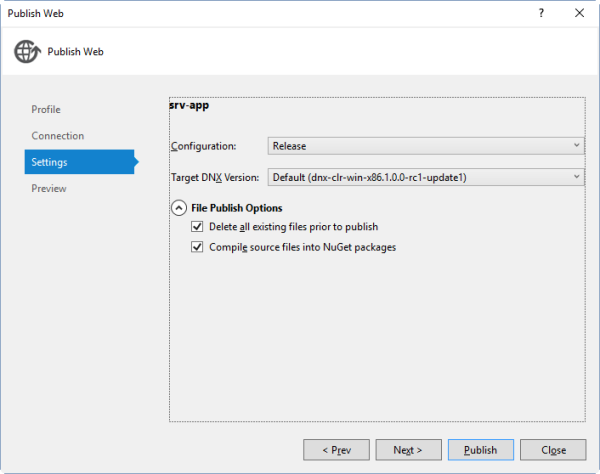 The only changes I made to the defaults are hidden on the Settings page in the collapsed File Publish Options group: I checked both Delete all existing files prior to publish and Compile source files into NuGet packages. All of the files created by Visual Studio in the selected Target location need to be copied to a server or directory where IIS can access them. For ASP.NET Core applications to work in IIS, HTTP Platform Handler needs to be installed in IIS. It is available separately in 32-bit and 64-bit versions. Before continuing you should make sure it is correctly installed by checking the list of Modules at the server level in IIS Manager. Now you can create a new web site or application and set its Physical path to wwwroot (not approot!) subfolder inside the publish folder. If you decided to publish the app as a new web site, that's all you needed to do and the application already works. If you deployed it as an IIS application instead, you will receive a 404 - Page Not Found error when navigating to the newly created application because of a bug in IIS integration. Deploying the app with this change into an IIS application with matching relative path will now work as expected.